Singapore is planning a national broadband network that would provide ultra-fast Internet access at speeds up to 1Gbps for every home and business. "Today, a high-speed broadband network is an essential infrastructure for economic development, investment, talent attraction, education and a host of other activities," says Lee Boon Yang, Singapore's minister for information, communications and the arts. In a speech, Lee said the country's current broadband infrastructure will not be able to cope with surging demand for data access in the years ahead, making a network upgrade necessary. The planned Next-Generation National Broadband Network, which was first outlined in Prime Minister Lee Hsien Loong's budget speech in February, will connect all homes, schools and businesses in Singapore. A wireless broadband network will also blanket the city-state. Government officials view broadband Internet access as a priority for Singapore's economic development. The country was among the first in Asia to embrace the Internet during the 1990s, but since then other countries in the region, such as South Korea and Japan, have built faster, more advanced networks. The upgraded broadband network will allow Singaporeans to make video calls to stay in touch with relatives and friends overseas, according to Lee, the information minister. In addition, the faster connections will make new consumer services possible, such as high-definition Internet protocol TV. "It will sharpen our business efficiency and spark off many new opportunities for entrepreneurs," he says. The government plans to work with private companies to build the network, Lee says, and is prepared to provide funding to kick-start the project. 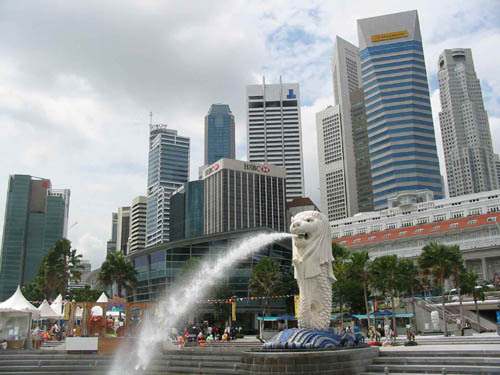 As a first step, Singapore's Infocomm Development Authority (IDA), a government agency, has invited service providers to submit proposals for offering wireless broadband. The operating model specified by IDA requires service providers to offer a basic service for the lowest possible cost, which may include one year of free access. Service providers also must offer a premium service, for which users would pay more.